If someone has scoliosis, it means their spine curves sideways. 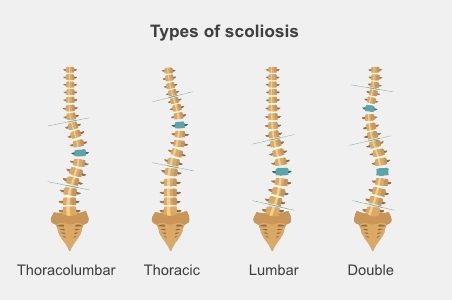 Scoliosis makes a person's vertebrae (the bones in their spine) twist or rotate, so that instead of looking like a straight line down the middle of their back their spine looks more like the letter C or S.
Curves most commonly happen in a person's upper or middle back (their thoracic spine), but they can involve the whole spine. Scoliosis can happen to people of any age, but it most often starts in children when they are between 10 and 15. It tends to get worse as a child grows and doesn't usually get better without treatment. However, it usually isn't a sign of anything serious. If a child has mild scoliosis that first shows in adolescence, they may never need treatment. However, if a young child develops scoliosis, or if it gets worse rapidly they will need treatment to stop it from causing problems. Mild scoliosis won't get any worse once a child stops growing, however severe scoliosis will continue to get worse after this. As well as defining scoliosis by where in the spine it starts, we also define it by what causes it. In children there are three different types: idiopathic, congenital, and neuromuscular. Idiopathic (id-e-o-pa-thik) simply means we don't know the cause. This is the case in around 80% of cases of scoliosis in children. Most cases of idiopathic scoliosis happen between the age of 10 and the time a child is fully grown. It happens to boys and girls, but girls are likely to have more serious curves that need medical treatment. Congenital (kon-gen-it-al) means something a baby is born with. Problems sometimes develop in a baby's spine as it is growing in the womb. Babies with congenital scoliosis may have spinal bones that are not fully formed, or that are fused together. Congenital scoliosis usually starts earlier than idiopathic scoliosis, and is more likely to need treatment. Neuromuscular (new-ro-mus-cue-lar) means related to the muscles and nerves. Conditions that affect a person's muscles and nerves, such as muscular dystrophy or cerebral palsy, can cause imbalance or weakness in the muscles that support the spine, leading to scoliosis. What problems does scoliosis cause? Scoliosis can change a child's posture and the way they walk. Severe scoliosis can make them appear quite deformed. Because it changes the shape of a child's chest, it can also affect the way their lungs and other organs work.